Stitches and Scissors: Large rectangle squares quilt - tutorial. 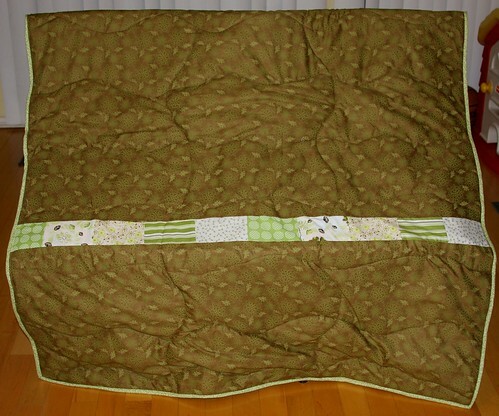 Large rectangle squares quilt - tutorial. 1. Materials that you need. 2. Cut four 8 1/2 " x 18" rectangles of each fabric. 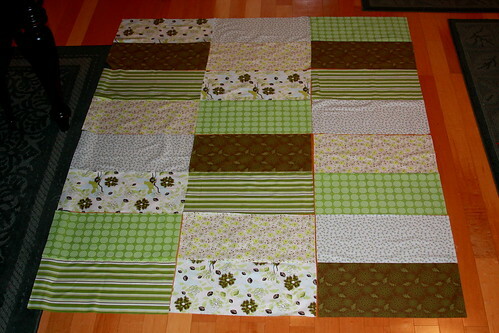 Do this for all 6 fabrics for a total of 24 rectangles. 3. Sew 2 of the rectangles together, right sides together, with a 1/4" seam allowance. Iron down the seam. 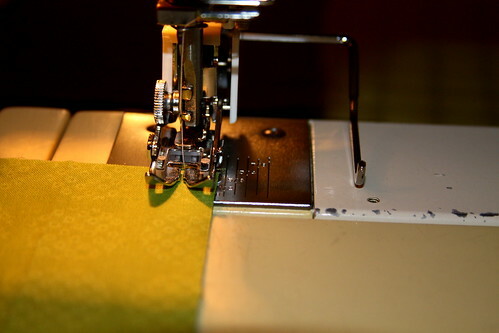 Continue until all rectangles are sewed in pairs and ironed. 4. Layout the rectangle squares on the floor in the pattern that you want. 5. 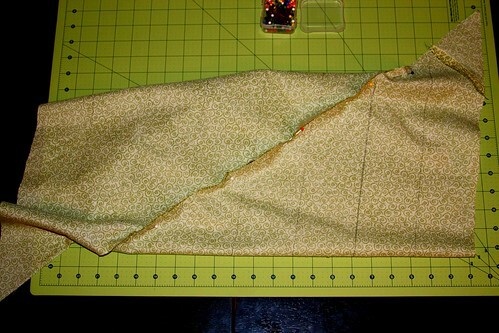 Take a picture of your "top" so that as you sew you can make sure you are sewing them together in the pattern you want. 6. 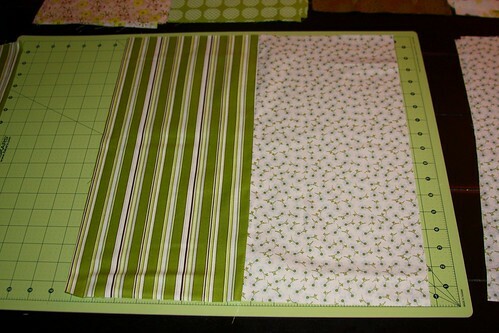 Sew them into rows, right sides together, with a 1/4" seam allowance, iron down the seams. Then sew the rows together, until the whole top is done. 7. 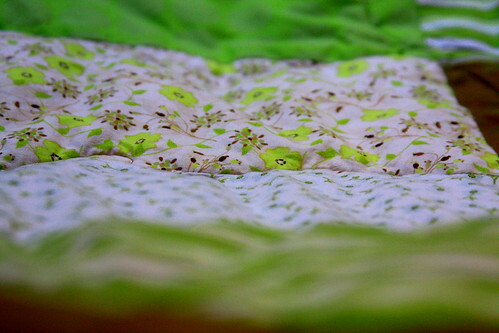 Lay the 3 yards of fabric for the back of the quilt out. Fold in half. 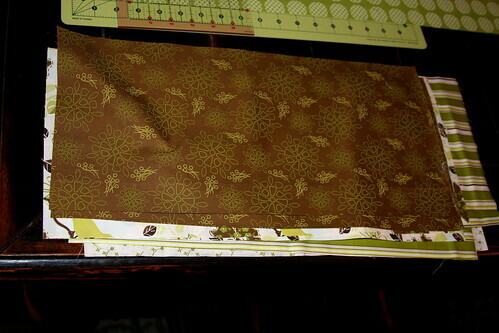 Cut on the fold, so that you now have two 54" pieces. 9. Trim off any access so that it is a straight line. 10. 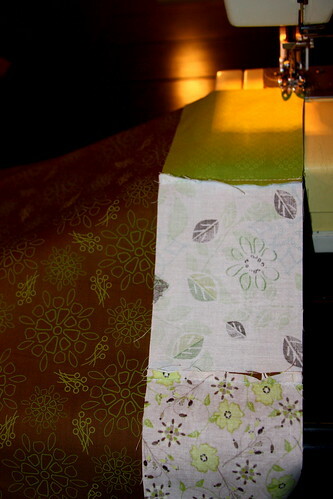 Sew the long strip onto one of the 54" quilt pieces, right sides together with a 1/4" seam allowance. Then sew that to the other back of quilt piece, so that you now have the back of the quilt all together. There you go. 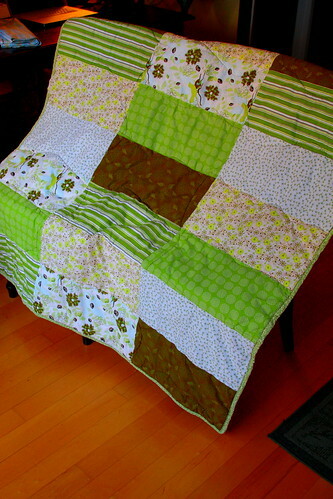 Now all you have to do is baste the quilt, there is a tutorial on it here. Then quilt it and bind it together. Here is the continious binding tutorial that I use. 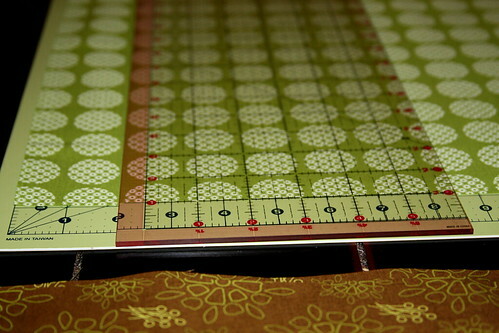 I just use 3" for the binding and not her 2.5". She does not have a picture of how it looks all pinned so I added one here. 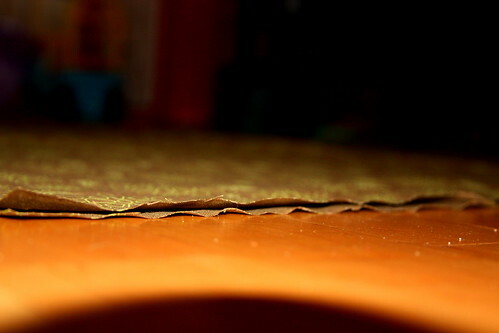 You sew on the line with the pins and then cut, and I always forget so here is what it should look like. 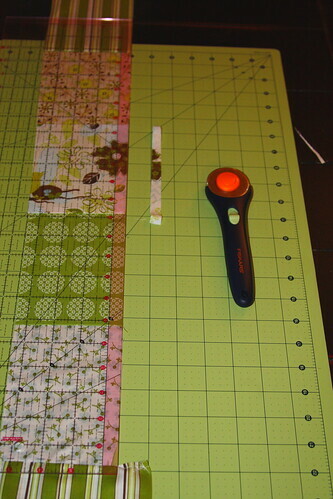 Tip: It does not lay nice and flat so if your piece is laying nicely then it is not pieced together correctly. If you are worried it will bleed, Crazy Mom Quilts says to add a cup of salt in the wash. The back of the quilt. Doesn't the line of squares look great? It measures 52 1/2" x 62", we will see what it is after I wash it. All folded up. I love how it looks. Right out of the dryer. If you have any questions, leave them in the comments section and I will answer them. Have fun. it looks great! i'm glad to see that it survived the washer - hee hee! 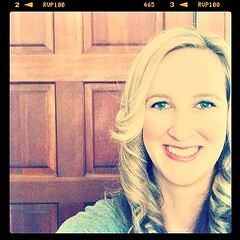 :) great tutorial - can't wait to see what you do next. This turned out really nice, I like the colors. Thanks for the link for basting too! I was trying to remember where I saw that! I love the brown and green fabric you used on the back- do you know what it's called?? 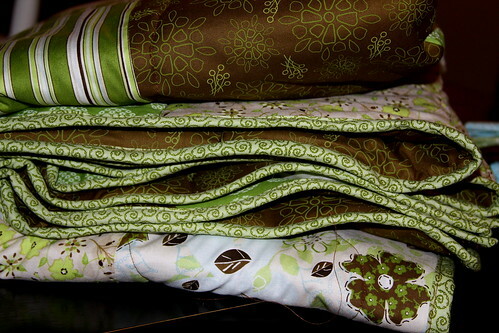 Sarah, the brown and green material is at JoAnn's it is one of their Calico prints. It looks nice! I bought that kit at Joann's but haven't done it yet. Baby Care Products, [url=http://babybabymart,com/deals/Baby+Clothing Sets/]Baby Clothing Sets[/url], [url=http://babybabymart,com/deals/Baby+Sleepwear/]Baby Sleepwear[/url], [url=http://babybabymart,com/deals/Baby+Crib+Bedding/]Baby Crib Bedding[/url], [url=http://babybabymart,com/deals/Orbit+Baby+Strollers/]Orbit Baby Strollers[/url], [url=http://babybabymart,com/deals/Graco+Infant+Car+Seat/]Graco Infant Car Seat[/url], [url=http://babybabymart,com/deals/Baby+Wipes/]Baby Wipes[/url]. I like the way this turned out. Your tutorial is wonderful and I think I am going to give it a try. I will get back with you on how it turns out...thanks so much for your help. I loved this idea. The strip down the back was so great! I often need just a bit more to fabric for the backing and this is a great solution. Thank you for sharing.